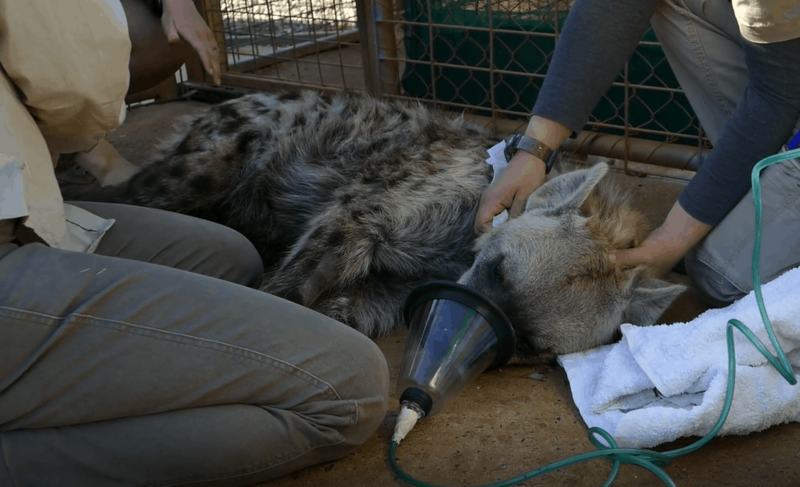 A sweet 18-month-old Spotted Hyaena cub had a visit with the vet today at Monarto Zoo. This morning, male cub Jaali, was given a full-body examination where his eyes, teeth, ears and general health were examined. We’re pleased to say the young male was given a clean bill of health! Monarto Zoo Carnivore Keeper Jaimee Button said she was very happy with the positive results from Jaali’s check-up. “This was Jaali’s first general anesthetic, so we really took the opportunity today to give him a good look over to ensure he’s healthy,” Jaimee said. “Apart from a little bit of dental plaque, we’re happy to see he’s looking perfect! Jaali was one of twin cubs born to first-time parents Thandi and Piltengi in September 2017. The young pair can now lay claim to being part of the biggest Spotted Hyaena clan in Australia, who act as ambassadors for their wild cousins. “Hyaenas are often a misunderstood species, but in fact they are incredibly intelligent and have wonderful characters,” Jaimee said. “Research has proven hyaenas are excellent problem solvers and at times can even outperform great apes with problem-solving tests. The Spotted Hyaena remains widespread in Africa, although there is continuing decline in wild populations outside protected areas due to habitat loss and persecution. Hyaenas live in complex matriarchal family structures which can grow to include up to 80 individuals. Young visitors can learn more about the work of our vet department at both Monarto Zoo and Adelaide Zoo these school holidays. The ‘Dr Zoo’ themed holiday program will involve fun onsite activities such as colouring-in, and a Dr Zoo activity trail where kids can learn all about treating animals, diagnosing problems or caring for pregnant animals.